Dissolve the yeast in the milk or water in a large bowl and mix with the other wet ingredients. Mix the dry ingredients in a separate bowl and add a little at a time into the the wet ingredients bowl. Knead for at least 10 minutes and let rise covered for 1 hour. 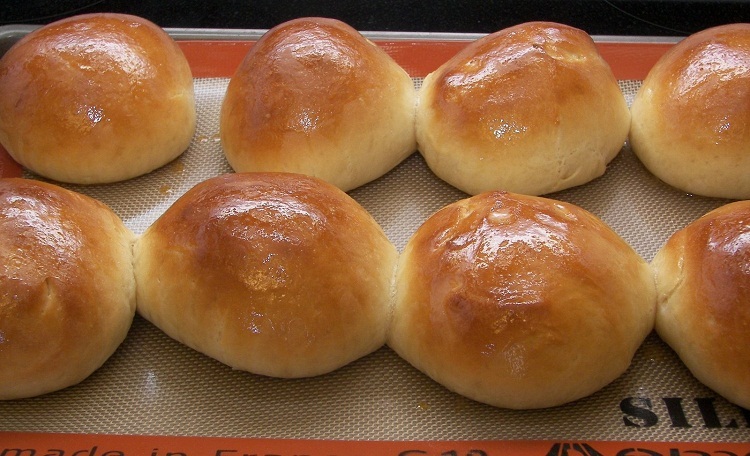 Divide into 8 pieces if you choose to make hamburger buns or into 12-18 if you just want dinner rolls like you get at the restaurant. By the way, these resemble something I had at a Logan’s Roadhouse. Yes, the one where you throw the peanut shells on the floor. After dividing the dough into as many pieces as you choose, form balls and let them proof on a baking sheet or in a casserole dish (you will get 12-18 pull apart rolls this way) for approx 1 h.
Preheat the oven to 400 F and bake the rolls for 12-15 minutes or until browned. If you want yours to look shiny like mine, at about 5 minutes into baking top them with a mix of 1 TBSP melted butter and 1 TBSP honey, keeping in mind that they may be sticky on top. They seem to keep well in the fridge inside a plastic container/zip lock bag.